Nothing on this site constitutes legal advice; do not rely on this site, including its posted content, in taking any action (legal or otherwise). 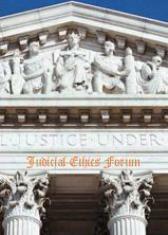 The Judicial Ethics Forum has no official affiliation with Legal Ethics Forum (legalethicsforum.com), but that site (whose principals are among the most highly respected scholars in the field of legal ethics) is a highly recommended resource. Do not post or link to any information that is false, tortious, discriminatory, in violation of intellectual property rights, or otherwise unlawful, and you agree to hold harmless and to indemnify this site, its owners, or its agents in full, including reasonable attorneys’ fees and costs, for any third-party claims arising out of the content you or your agents post. If you disagree with, or have not reviewed, anything in Terms and Disclaimers 1 through 6 above, please refrain from posting on, or using in any way, Judicial Ethics Forum.